The US has said Israel's authorisation of new building in a Jewish settlement in the West Bank does not violate a recently announced moratorium. But a state department spokesman said it was "the kind of thing that both sides need to be cautious of". Israel has promised a 10-month pause in settlement building in the West Bank, though not in East Jerusalem. It says the 112 new apartments in Beitar Illit settlement were approved ahead of the moratorium being declared. The move comes as the US announced that Israel and the Palestinians had agreed to hold indirect talks. Palestinian negotiators say the Beitar Illit announcement will place strain on an already fragile agreement to talk. 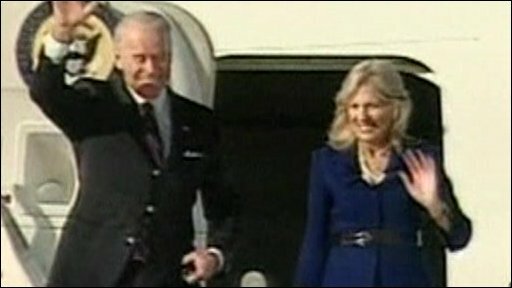 Meanwhile, US Vice-President Joe Biden has arrived in the region, becoming the highest-ranking US official to visit since President Barack Obama took office. US envoy George Mitchell is currently in the Middle East to mediate in what are referred to as "proximity talks". "I'm pleased that the Israeli and Palestinian leadership have accepted indirect talks," Mr Mitchell said in a statement on Monday. "We've begun to discuss the structure and scope of these talks, and I will return to the region next week to continue our discussions. "As we've said many times, we hope that these will lead to direct negotiations as soon as possible." But other Palestinian groups based in Syria, including the Islamist Hamas movement which runs the Gaza Strip, rejected the talks. They said the talks were bowing to pressure from Israel and the US. A breakthrough in the talks would surprise all sides, the BBC's Middle East editor Jeremy Bowen says. Speaking about the Beitar Illit development, US state department spokesman PJ Crowley told media in Washington on Monday: "On the one hand, it does not violate the moratorium that the Israelis previously announced. "On the other hand, this is the kind of thing that both sides need to be cautious of as we move ahead with these parallel talks." Beitar Illit has a mostly Orthodox Jewish population. Israeli ministers said the new apartment buildings would be allowed to go ahead because of what they termed "safety issues". A statement from the defence ministry said the building was needed to plug a potentially dangerous 40-yard gap between two existing buildings. The line from Israel's defence ministry is they needed to plug a potentially dangerous gap between steeply raked apartment buildings. They have decided that the best way to do this is to fill in the space with 112 new apartments. Palestinian officials see this only as further evidence of the flimsiness of Israel's current, self-declared settlement "freeze". As it is, there is plenty of construction carrying on inside these settlements, on buildings which were started just before the curb on new approvals came into effect at the end of last year. The Americans were hoping that Vice-President Joe Biden's visit to the region would coincide with the announcement of indirect talks between the Israeli and Palestinian leaderships. But shuttle diplomacy, brokered by the US, can only go so far. As the latest news shows, both sides have such a low opinion of each other's intentions that the prospect of direct negotiations - let alone agreement - remains remote. "Beitar Illit is an exceptional permit that came about following safety problems in the infrastructure," the statement said. The building permits were issued under the previous government of Ehud Olmert and before the settlement pause was announced. The Palestinian leadership in the West Bank had demanded a complete stop to settlement building as a precondition to re-engaging in talks which broke down more than a year ago. They agreed "grudgingly", reports said, and came after many months of shuttle diplomacy from Mr Mitchell. The talks should be limited to four months, Palestinian officials said. Under heavy US pressure, the Israeli government agreed in November to a temporary and partial pause in building. It said that work which had already started on 3,000 homes should be allowed to continue, and further exceptions to the pause were possible. Israel has refused to stop building in East Jerusalem, which the Palestinians say they want as the location of a future capital of a Palestinian state. Palestinian negotiator Saeb Erekat said the move put the talks at risk. "If the Israeli government wants to sabotage Mitchell's efforts by taking such steps, let's talk to Mitchell about maybe not doing this if the price is so high," he was quoted by the Associated Press (AP) news agency as saying. Israeli Environment Minister Gilad Erdan said the settlement was "an exception" to the building pause. "At the end of last year the government decided to freeze construction, but this decision provided for exceptions in cases of safety problems for infrastructure projects started before the freeze," he told Army Radio. Peace Now, an Israeli group, said the announcement raised questions about Israel's commitment to the peace process. "The Israeli government is welcoming the US vice-president by demonstrating, to our regret, that it has no genuine intention to advance the peace process," the group's settlement expert, Hagit Ofran, told AP. 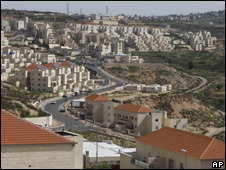 All settlements in the West Bank, including East Jerusalem, are considered illegal under international law, although Israel disputes this.